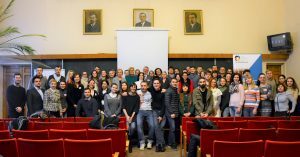 The first part of the German-Ukrainian Forum of Young Researchers has been organized by Eberhard Karls University of Tübingen in cooperation with the German-Ukrainian Academic Society. The Forum consists of two parts: an exploratory and networking tour “Research in Ukraine” (Kyiv and Lviv or Kharkiv), which took place on 7-12 December 2017, and an intensive grant writing and coaching workshop. The latter will be organized in Berlin (9-10 February 2018) for up to 10 research tandems, i.e. for those Forum participants, who could demonstrate high potential in developing bilateral collaborative projects with researchers from the partner country. This event has been supported by the DAAD from the means of the German Federal Ministry for Education and Research (BMBF). Many academic partners in Ukraine significantly assisted with the organization and information support of the first part of the Forum, in particular: Center of German Law at the Taras Shevchenko National University of Kyiv, Institute of Mathematics of the NAS of Ukraine, Kyiv Academic University (KAU), National University of Kyiv-Mohyla Academy (NaUKMA), Ukrainian Catholic University (UCU) in Lviv, Ukrainian-German Academic Center at the V. N. Karazin Kharkiv National University in Kharkiv, the Council of Young Scientists of the NAS of Ukraine, Kyiv Information Center and regional Lecturers of the German Academic Exchange Service (DAAD) and the Embassy of the German Federal Republic in Ukraine. Participants of the Forum at the Institute of Mathematics, NAS of Ukraine, Kyiv. Photo: Olga Tucha/ German-Ukrainian Academic Society. 45 participants from different areas of research, – exact sciences and engineering, life sciences and biomedical studies, social sciences and humanities, – took part in the first part of the Forum. Young researchers, who have just obtained their PhD, as well as those with a few years of post-doctoral or group leader/ associate professorship experience represented universities, research institutes and companies from Cherkasy, Ivano-Frankivsk, Kharkiv, Kyiv, Lviv, Odesa, Mariupol and Sloviansk in Ukraine, and from Berlin, Dresden, Hannover, Munich, Stuttgart, Potsdam, Tübingen and Wildau in Germany. The main goal of the Forum was to familiarize young researchers from Germany with the scientific landscape and contemporary research in Ukraine and to enable researchers from both countries to get acquainted, exchange ideas and prepare concepts for possible joint research projects. The Forum’s participants had the opportunity to visit the leading universities and scientific institutes of the NAS of Ukraine in Kyiv, Kharkiv and Lviv, and present their own research. During the dedicated session “Funding Opportunities for German-Ukrainian and International Cooperation” the participants and other interested researchers from among the Ukrainian academic community also had an excellent opportunity to find more about research grant schemes that provide funding for joint research projects and support scientific mobility of young researchers both from Ukraine and Germany, such as the State Fund for Fundamental Research of Ukraine (presented by its director Prof. Borys Grynyov), European Research council (presented by the ERC National Contact Point in Ukraine Valentyna Andruschenko), German Academic Exchange service (DAAD, presented by the head of the DAAD Information Center in Kyiv Dr Gisela Zimmermann), Alexander von Humboldt Foundation (presented by Prof. Olexandra Antoniouk, the President of the Humboldt Club Ukraine), BAYHOST (Bavarian Academic Center for Central, Eastern and Southeastern Europe, presented by Lisa Hermsen), Leibniz Science Campus “Eastern Europe – Global Area” (EEGA, presented by the visiting researcher Dr Svitlana Potapenko), and numerous other funding opportunities offered by the DFG, Helmholtz Association, foundations, etc. During this part of the Forum the participants could also learn firsthand about the establishment of the National Research Foundation of Ukraine from the member of the Scientific Committee of the National Council of Ukraine for Development of Science and Technology Prof. Alla Yemets. During the Forum the participants were also able to learn about the ‘best practice’ examples and communicate with experienced researchers, who have long been cooperating successfully. These included: Prof. Jochen Fornasier from the University of Frankfurt am Main and Dr Alla Buiskikh from the Institute of Archeology of the NAS of Ukraine, who carry out excavations of the settlements of ancient Olbia in the south of Ukraine, Prof. Jörn Kalinowski from the University of Bielefeld and Dr Bohdan Ostash from Ivan Franko National University of Lviv, who jointly focus on potential new classes of antibiotics, as well as Prof. Oleg Avrunin from the Kharkiv National University of Radio Electronics and Prof. Birgit Glasmacher from the Leibniz University of Hannover, whose teams have established the long-term cooperation in the field of biomedical engineering. Photo collage: participants of the Forum, photo on the right side: Prof. Jörn Kalinowski, University of Bielefeld. Individual photos: courtesy of Olga Tucha/ German-Ukrainian Academic Society. Successful German-Ukrainian tandems of researchers, who have developed joint research proposal concepts, will be invited and supported to take part in the second part of the Forum, which will be held in Berlin in early February 2018. Furthermore, the research partners from Ukraine will also have the opportunity to visit the laboratory/ research institute of their potential partner in Germany in order to learn more about their research and discuss their potential future joint projects.